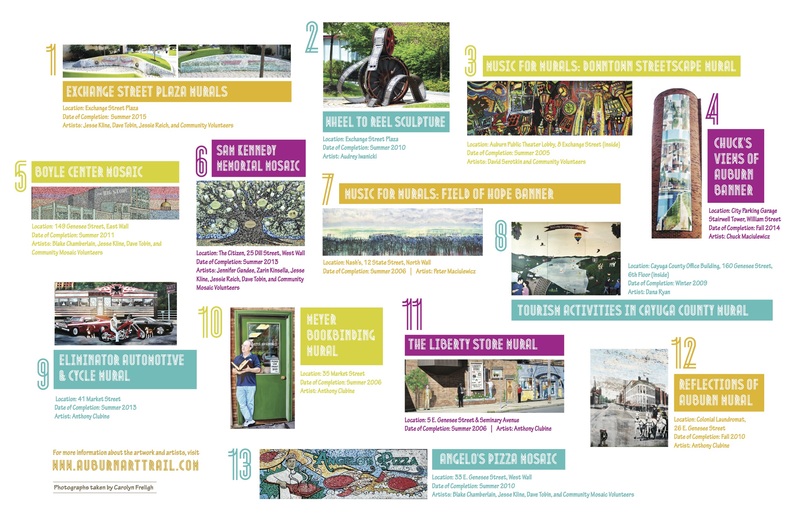 The Community Mosaic Project’s goal is to engage residents in an artistic effort to visually improve their community, while instilling & increasing civic pride. In the spring of 2010, project managers Jesse Kline and Dave Tobin participated in an outdoor mosaic training session with Philadelphia mosaic artist Isaiah Zagar. At quick pace, from then on, they took their skills & techniques to task and led several outdoor mosaic installations in and around downtown Auburn, with the enthusiastic help of hundreds of community volunteers of all ages. Throughout this process, both materials & refreshments have been generously donated by community businesses, and beneficial partnerships with building & property owners have been established. Yet, the financial backing and encouragement from Executive Director Guy Cosentino & the Stardust Foundation of Central New York was critical to the group’s success. For more information & images check out Art for Auburn, or contact Jesse Kline at jessekline31@msn.com. Grand-scale outdoor commercial muralist Tony Clubine is a self-taught artist raised in Texas, and now living in Cicero, NY. He uses a technique called trompe l’oeil, a French term referring to something that deceives the eye. Tony is a master at painting murals that have depth and three-dimensional perception for the viewer. He has brought new life & vibrancy to many brick walls in Downtown Auburn, while celebrating the businesses located there. For more information find him on Facebook, or contact him at anthonyclubine@gmail.com. This event & fundraiser ran for two consecutive years, hosted & organized by the Auburn Downtown BID. It combined live music & dance acts, local food and art-making activities to raise awareness & resources for installing public art projects downtown. For more info on the BID visit auburndowntown.org or call (315) 252-7874. 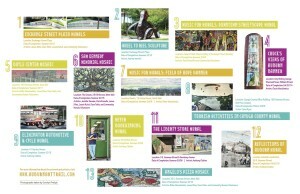 Ready to buy some local art? The Finger Lakes Arts Council is the perfect place to purchase local artwork and support Auburn’s burgeoning art scene. The elegant retail gallery space also hosts First Fridays, workshops, classes, and special events, and is located right in the heart of downtown Auburn’s public art trail at 101 Genesee St. It is open Tuesday-Friday from 11:00am to 7:00pm and Saturdays from 11:00am to 4:00pm. For more information, please call (315) 283-7102 or visit fingerlakesarts.org. Want to be on the trail? If you are an artist and have an idea for a cool public art project, check out this resource for local arts grants.